The sun's disk showing active region 10486, which became the largest sunspot seen by SOHO, the satellite Dr. Kuhn and collaborators used to monitor the sun's diameter. Courtesy of SOHO/MDI consortium. (PhysOrg.com) -- A group of astronomers led by the University of Hawaii's Dr. Jeff Kuhn has found that in recent times the sun's size has been remarkably constant. Its diameter has changed by less than one part in a million over the last 12 years. “This constancy is baffling, given the violence of the changes we see every day on the sun's surface and the fluctuations that take place over an 11-year solar cycle,” commented Kuhn, the associate director of the University of Hawaii Institute for Astronomy (IfA) who is responsible for Haleakala Observatories. Kuhn's work is part of worldwide efforts to understand the influence of the sun on Earth's climate. “We can't predict the climate on Earth until we understand these changes on the sun,” he said. Kuhn and his colleagues used NASA's long-lived Solar and Heliospheric Observatory (SOHO) satellite to monitor the sun's diameter, and they will soon repeat the experiment with much greater accuracy using NASA's new Solar Dynamics Observatory (SDO), which was launched on February 11. The most stable configuration would be a solid surface of some sort(iron, metal). That would lead to a different model of gravity but we know gravity has problems anyways. The sun would act as a cathode. If the diameter was to expand (or shrink) constantly by "one part in a million every 12 years" then in 12 million years, the total diameter would reach about ~272 percent (or just about ~36,8 percent) of what it is now, respectively. That would be quite a huge fluctuation for such a small time period, considering we are not nearing the end of Sols life. I believe the expectations on the lifespan of Sol (before it goes into "retirement") are a few orders of magnitude higher that that. Apart from the fact that it has some good 5Gy of duty on its shoulders allready, which most probably - at least in the beginnigs - were alot more "violent" than nowadays. If the sun is changing at that rate how small or big was it 4.568 billion years ago? What are the implications for a differently sized sun at that stage of earth's development? What are the implications for the start and sustenance of life at that time? Actually, the logical conclusion of the "standard model" of stellar formation is that the sun must have been LARGER in the past. Since hydrogen is obviously far less dense than any other materials, as elements are fused, the sun's mass must contract inward by a significant amount, not to mention that the sun's actual mass has decreased over time due to solar wind and other ejecta, as well as the loss of energy in the form of photons and other radiation. In summary, one would actually expect the Sun to shrink gradually with time, both in radius and in total mass. The radius should shrink with time because more and more hydrogen is being crushed into heavier elements, which take up less space. The mass should decrease with time because of all the energy that has escaped, since e = mc^2. Of course, there would be fluctuations as the rate of energy production changes as different types of elements are fused in different amounts, but the general rule is "sun shrinks". We have uncovered so much about the sun over the last couple of decades that a paradigm shift is called for. The sun is not a giant gas ball, and it certainly is not contiguous in composition from core to surface. All the evidence points to the sun being composed of a solid iron mantle whose surface temperature is about 2,500 degrees kelvin. It is surrounded by an atmosphere composed mostly of neon plasma. The hottest temperatures are not found on the surface, but in the ionosphere, where they reach about 5,000 degrees Kelvin. For thos who are skeptical, it should be noted that iron has maintained its solid state in the laboratory at temperatures exceeding 5,000 degrees Kelvin. The solid sphere that is the mantle explains why the sun will vary almost not at all in diameter, which would be largely a function of measurements of the extent of the ionosphere. maybe there is still a ball of neutrons at the center of the sun. This could explain the stable size as gases are expelled from the sun, the neutrons in the center would be constantly decaying into more hydrogen gas keeping the size relatively the same over a long period of time. This explanation has some logics in it, but neutrons are commonly decaying into electron antineutrinos - whereas the content of antineutrinos in solar neutrino flux is generally lower, then 5%. Anti-neutrinos from neutron decay have very low energy, E < 0.782 MeV, and cannot be observed by most detectors. How about looking at the actual mechanics of the sun. Gravity and strong nuclear forces balance out to both crush and blast apart the sun at a constant rate, maintaining a close to spherical shape around the combined center of mass. At the center the core is crushed creating immense pressure and heat which cause expansion. 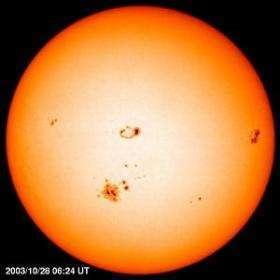 The sun is always getting hotter during the hydrogen cycle which we are in. Now, the balanciung act between gravity and thermal based velocity aren't perfect across different molecules. Some are expelled at high speeds (the solar wind) and most are held in the general locus of the sun. If the escape of the solar wind was greater then the sun woudl shrink. If it were lesser the sun would expand. What's interesting is that over large scales the sun appears to be constant, however we know that on shorter scales it is not. This research is interested in loger scales, and is attempting to determine a mechanism that maintains this balance.